Stupidfresh: Making Fashion From Park Slope Food Coop "Shame"
0 Comments Published by Matt on Thursday, December 3, 2009 at 1:43 PM. From Gothamist: Making Fashion From Park Slope Food Coop "Shame": "
Do you feel ashamed and guilty because you haven't been fulfilling your duties as a member of the Park Slope Food Coop? Have you been missing shifts, drinking bottled water, or purchasing Israeli products? Do you feel like horrible person because of it? 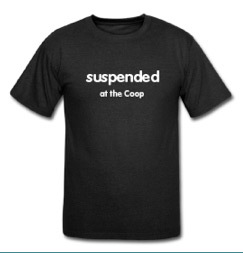 Here's a way to repent — wear a t-shirt announcing the fact that you've been "suspended at the Coop." The creator of the tees — which include shirts reading "Active at the Coop," "on alert at the Coop," "Grace Period at the Coop," "Pulling A Double at the Coop," and "Doing A Makeup at the Coop" — didn't make the shirts so that law-abiding coop members could identify shift-missing peers by their Hester Prynne-style garb. But he says he was '[i]nspired by the invisible mark of shame' felt by the writer of a recent Times treatise on rule-breaking Coop members. You can get the shirts here, and $5 from every purchase will go to a Brooklyn hunger-relief charity.